Home » Bush Biking » Bush-biking ? What ? What on earth is bush-biking ? That’s a question I’ve been asked several times since publishing my column in the local paper. If you Google for bush-biking you probably won’t find a definition. It’s a phrase I use to describe my combined passion for cycling and bushcraft. I initially likened it to Bear Grylls on a mountain bike, but have since decided it’s more like Ray Mears on a mountain bike. The reason being that Bear is all about surviving to escape the wild, whereas Ray is about embracing and living in nature. In some ways, bush-biking is similar to bicycle touring and bikepacking. Both of which use the bicycle to travel to multiple destinations. Bicycle touring brings up images of a bike loaded with four large panniers on a long distance trip. 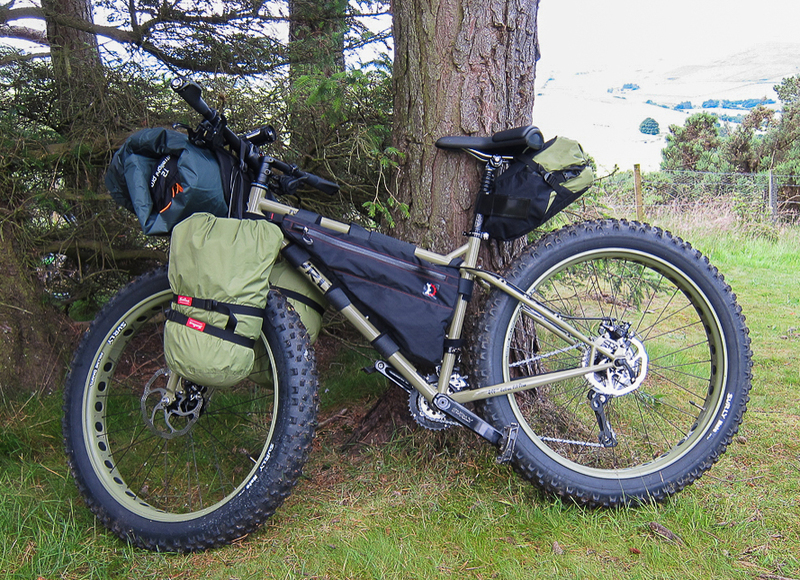 Bikepacking is the lightweight version of bicycle touring and is usually done off road. Cycling with minimal gear packed in a frame bag, seat pack, or handlebar bag allows for fast and streamlined riding on the trails. Bush-biking, on the other hand, is about selecting a place to camp and using a bicycle to get there. The location is usually in the middle of nowhere, away from people, and where you can enjoy nature undisturbed. Camping and bushcraft are the main focus of the trip. Cycling is the enabler. What bushcraft is about, is learning and using wilderness skills. Learning to live in, and appreciate nature. Learning how to forage from the wild. It’s about learning the skills that our ancestors used every day to stay alive. And most of all, it’s about having fun while doing so. Imagine falling asleep next to the campfire gazing up into the starry evening sky. Then waking up as the dawn breaks to reveal nature in all her glory, with the birds singing and the mist rolling over the hilltops. That’s what I’m talking about. Let’s start with the basics. As a minimum, I suggest you have a tent, sleeping bag, sleeping mat, camping stove, pot and mug. If you’ve got these at home already, you’ve got enough to start with. You’ll also need to carry your kit. A rucksack will suffice, but be aware that carrying a large rucksack while cycling is not that comfortable. You don’t need to spend a lot of money on additional equipment, but like most activities you can if you want to. Bushcraft kit is available from a number of stores at prices ranging from reasonable through to eye-watering. Alternatively, there are many Internet forums on how to make your own or adapt existing items for use in bushcraft. A must is a first aid kit. I take one with me whatever type of outdoor activity I’m doing. There are plenty of small and reasonably priced kits out there. As you get more experienced and focusing on new skills you’ll probably collect more kit. And if you like your comforts, and I do, you’ll definitely take more kit. You can use any bike as long as its capable of going off-road. And it helps if it’s reliable. Any mountain bike should do. I usually take my Surly fat bike which I’ve adapted with rack and fork mounted carry cages. (I’ll do a future post on this). I also have a bike trailer which is great for carrying equipment. 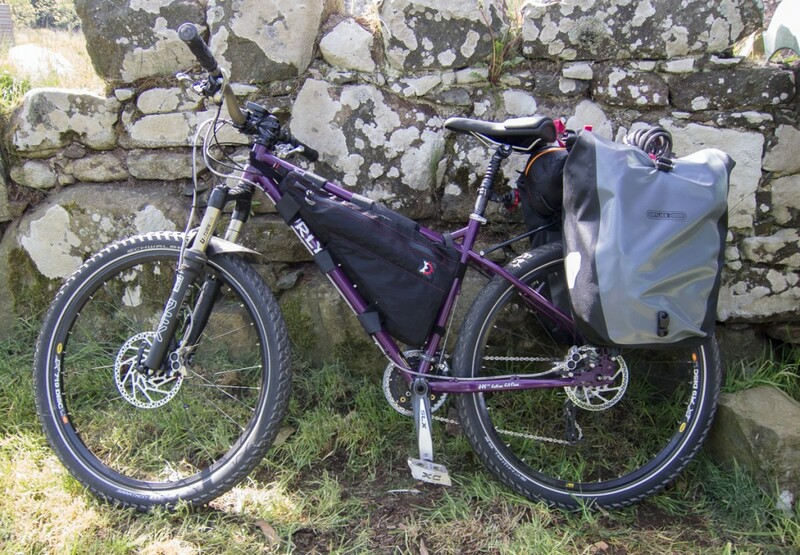 For load bearing, you can also use bikepacking carry gear such as a frame bag, handlebar roll, and seat pack. Equally rack and panniers work fine. I’ve tried all of these including some home-made options and have yet to find a setup that doesn’t work. My preference is usually the trailer though, as its quicker and easier to load up. The Million Dollar question is where do you go ? If you haven’t camped before or haven’t camped in a number of years, I suggest you camp in your back garden. You have a known and safe environment and if you have to bail-out, there’s not far to go. Learn how to put up your tent, inflate your camping mat and learn how to pack everything back in the bags it came out of. This is an often overlooked part of camping and one which causes a lot of frustration. Practice makes perfect. And for your next trip, I suggest you go to your local campsite. It will give you a good feel for how your bike handles when loaded, and what to expect before venturing out in the wilds for real. Once you’re comfortable camping out, it’s time to head out into the wilds. 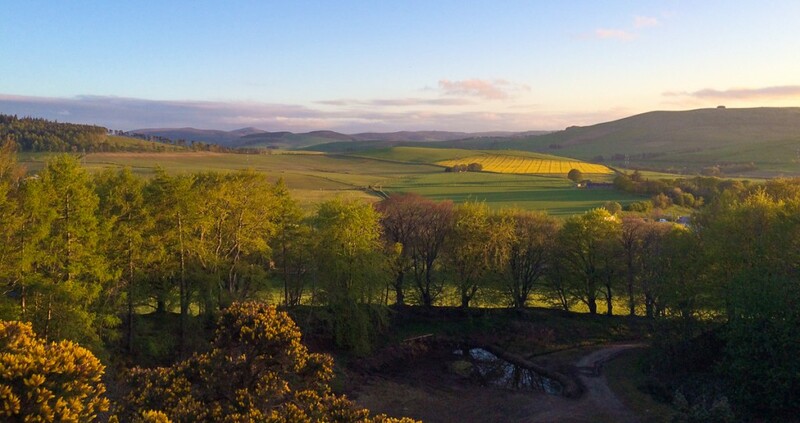 In Scotland, you can wild camp in the countryside but there are some limitations. These being mainly in enclosed areas with livestock or crops. 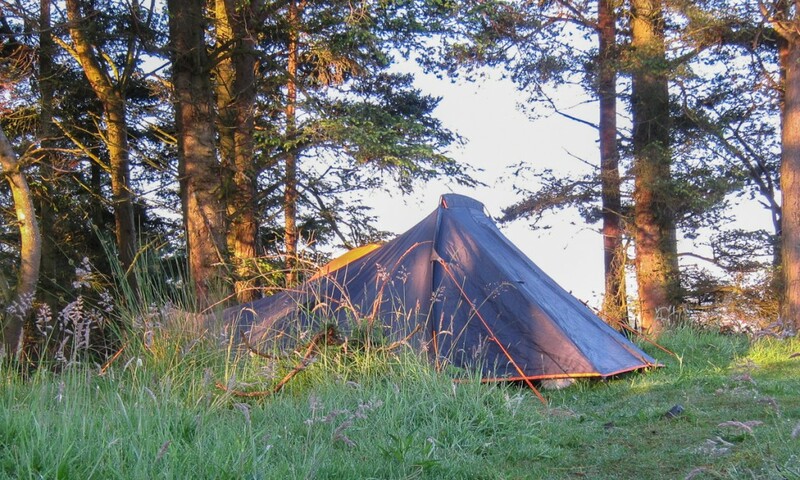 I’ve put a link to Wild Camping in Scotland at the end of this post. I’ll let you in on a little secret. It’s one thing camping on your own, in your garden or local campsite. It’s something completely different camping on your own in the middle of the woods. It takes a lot of getting used to. Your mind will play tricks on you. Adults can get frightened too. It’s the human fight or flight instinct kicking in. My main reason for bush biking is to enjoy nature’s surroundings and learn new skills. If I go by myself my kit includes a book, notepad and occasionally some wine. I try and learn new bushcraft skills, or improve an existing one. I use the time to learn about the plants, wildlife, and history of the area. And I use the solitude to contemplate. 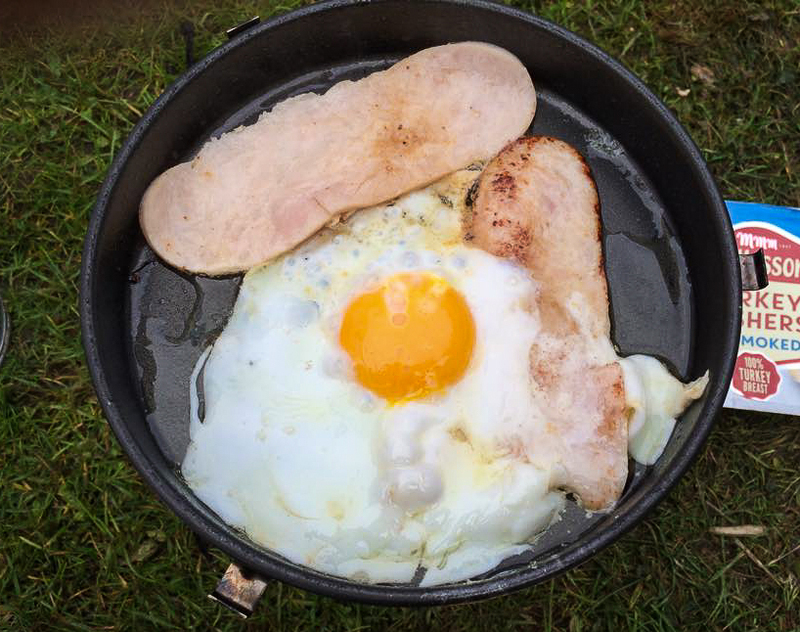 One of the most useful things I’ve learned is how to safely light and cook on a camping stove and wood burning fire. It takes a lot of skill to cook sausages, eggs, steak and mushrooms and make a pot of tea, all at the same time and without burning anything. Safety is always top priority when out in the wilds. We don’t have many dangerous critters in the UK , but there are other things that can make for an unpleasant trip. To stay safe follow these simple steps. It may seem daunting venturing out into the wilds, especially if you go on your own. But once you have the first trip under your belt it’s great fun. Enjoy bush-biking and connecting with nature. Take the opportunity to learn new skills and relax in quite surroundings. Go on your own, go with friends, or take the kids with you. It’s a great way of bonding. ….and remember to leave no trace. Your camping spot should look like no one has ever been there. Sounds like a kind of heaven. Don’t think the kids might manage without technology though for more than 3 hours! Still, be good to let them see how we used to have to amuse ourselves when we were their age! Thanks for this informative post. Most bush crafty folk seem to drive then walk short distances: nice to see a bicycle focused approach for those of us who prefer two wheels. I am planning to take my teenage son wild camping by bike this spring/summer, initially around the Lothians but maybe further afield in Scotland. We’ve done cycle camping and touring before, but using campsites. So your blog is very helpful indeed as we start on the wild camping journey. Thanks for the comments. I love travelling by bike and I love bushcraft, so combining them was natural. Ejnjoy your wild camping trip. If your up in Aberdeenshire, let me know. Great page…like to bushcycle too.